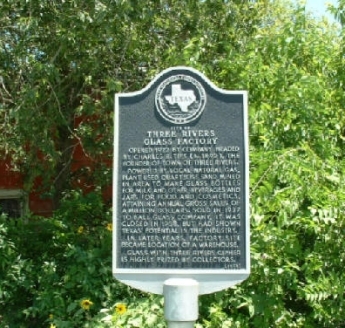 Three Rivers traces its beginnings to July 4, 1913 with a grand opening and first sale of land by Charles R. Tips. Tips, a University of Texas graduate and employee of the First National Bank of Seguin, came to the Brush Country at the urging of Mrs. Annie Hamilton of Cuero. Mrs. Hamilton owned a tract of land where Three Rivers now sits. The fledgling community was named Hamiltonburg, until the U.S. Post Office insisted that the name was too similar to "Hamilton", thus the change. Tips suggested Three Rivers because of the nearby confluence of the Atascosa, Frio and Nueces Rivers. The establishment of the Three Rivers Glass Company in 1922 was one of the most significant chapters in Three Rivers' history. The factory was established after the discovery of large deposits of Quartzone sand just north of Three Rivers. Quartzone sand is essential to the production of high-quality glass. Although the company had financial ups and downs it managed to capture a major share of the Texas commercial glassware market before its sale to a major competitor in 1937 and its ultimate closure. One of the original buildings still stands near the Frio River and examples of some of the bottles and jars made in the factory can be found in Three Rivers antique and collectibles shops. Today Three Rivers is a prosperous community of 2,000, many of whom work at the Three Rivers-Valero Refinery, originally Three Rivers Refinery built in 1933, or the Federal Bureau of Prisons Correctional Institution–the largest employers in Live Oak County.